Painting bricks white is one of the easiest and most effective ways to update an interior scheme. 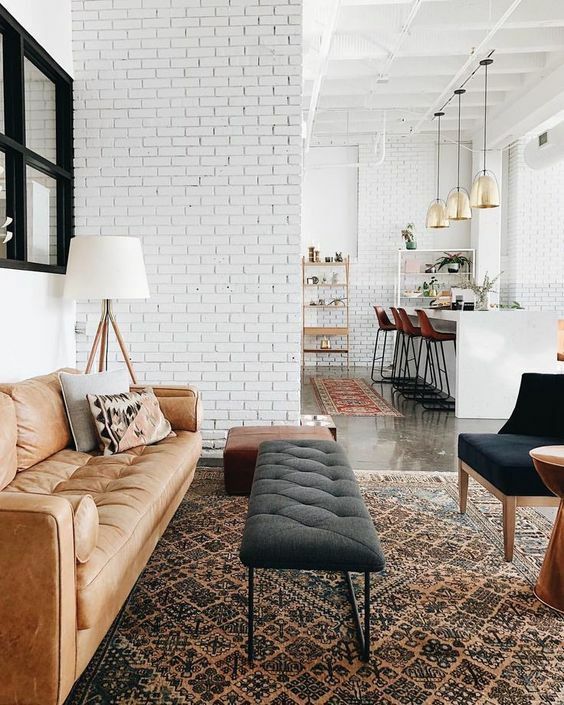 Bricks are certainly back in fashion and you only need to look at a trendy TV show to see a wall of bricks somewhere in a gorgeous loft apartment or warehouse development. However, there are a wide range of bricks out there, some from the 1970s, that really should never have been allowed to see the light of day. The orange ones used in my house really constituted a criminal offence, so they had to be covered up! 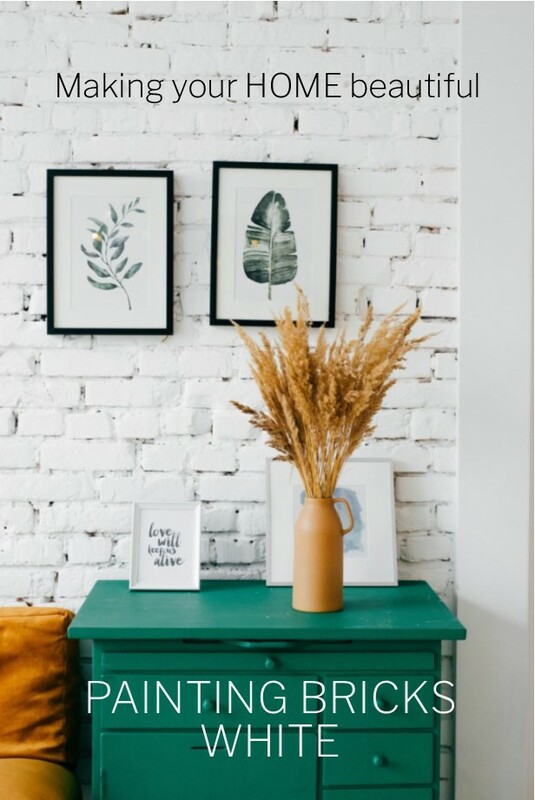 I really love the effect of painted bricks though so if you have an interior wall of unsightly dated bricks that you would like to cover up then consider painting them rather than just covering them with boring flat plasterboard. Pure white rooms are in fashion but I often feel that they are a little stark. If you do like them you must remember to introduce varying textures. This is the case if you use one colour generally but is often seen with white. The all white schemes that work are the ones with many different textures to bring some design elements to the space. The obvious area with this room in the image above is the wall of white bricks. 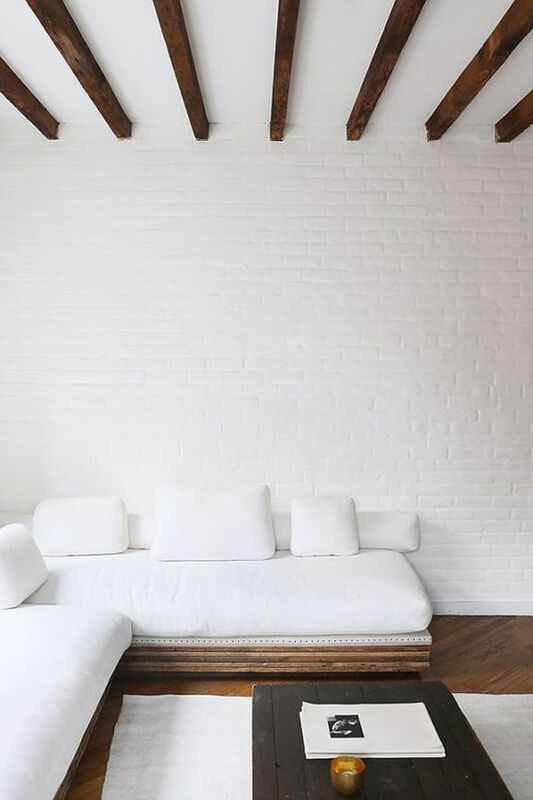 If this was a plain plastered wall, the effect would be overwhelmingly plain but the white bricks bring a lovely textural finish to the room. By painting the bricks with a very thick layer of paint you lose some of the roughness and texture of the surface and you can decide as you paint how much you want to build upon this. 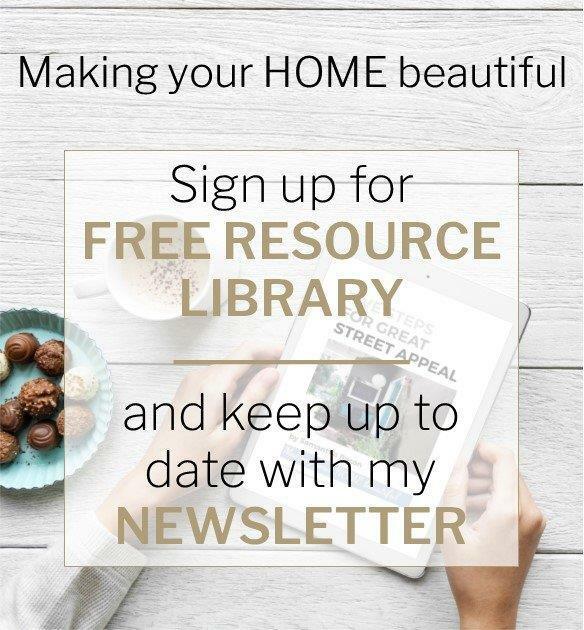 I was recently asked to select a new kitchen, flooring and paint colours for the apartment above that was going on the market. The brick wall was a lovely sandstock brick but it was a dated orange colour and the owner wanted it covered up. The builder had proposed to plaster over the top but I persuaded them to simply paint the bricks and I think that in a room that doesn’t have many architectural features that this ended up working really well. 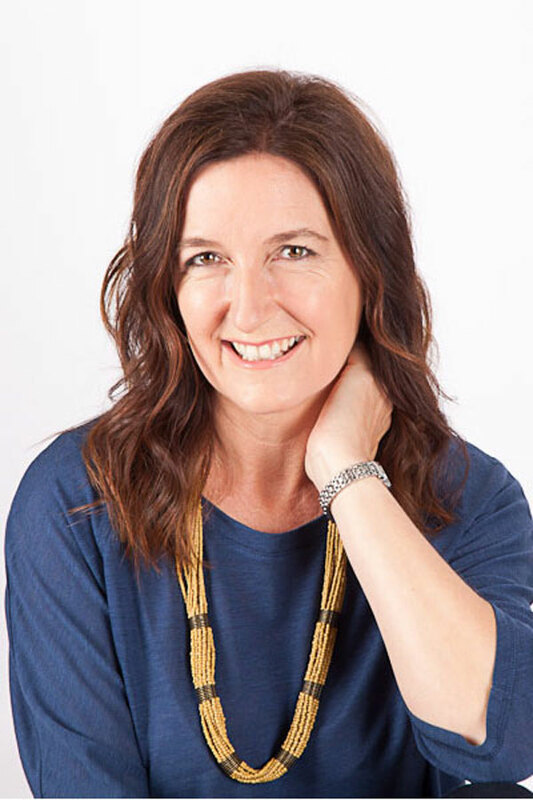 If you really love the texture of bricks and don’t want to have a completely white covering to them then you should read my post on New York Loft Bricks where I go through how to achieve an aged and weathered look. This image from Lively Brooklyn is a great example of how you can highlight the gorgeous texture in a rough wall of bricks. 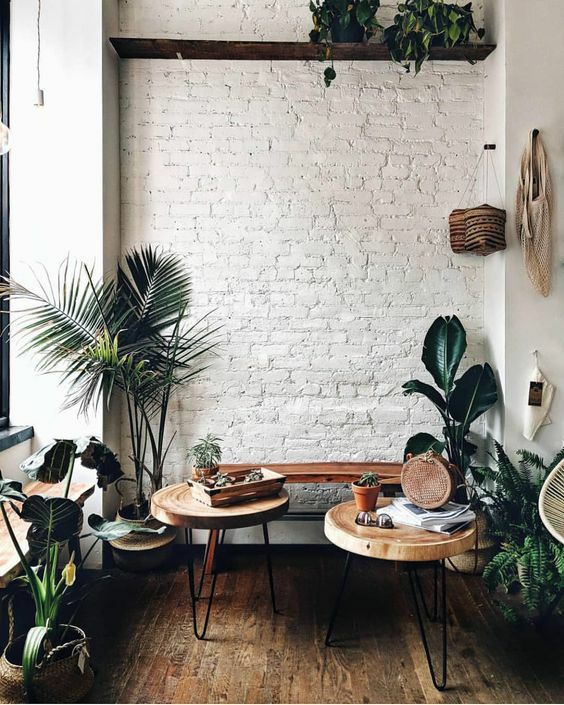 Painting the bricks white with gorgeous natural timber and lots of greenery gives you a great Boho vibe on a very small budget. 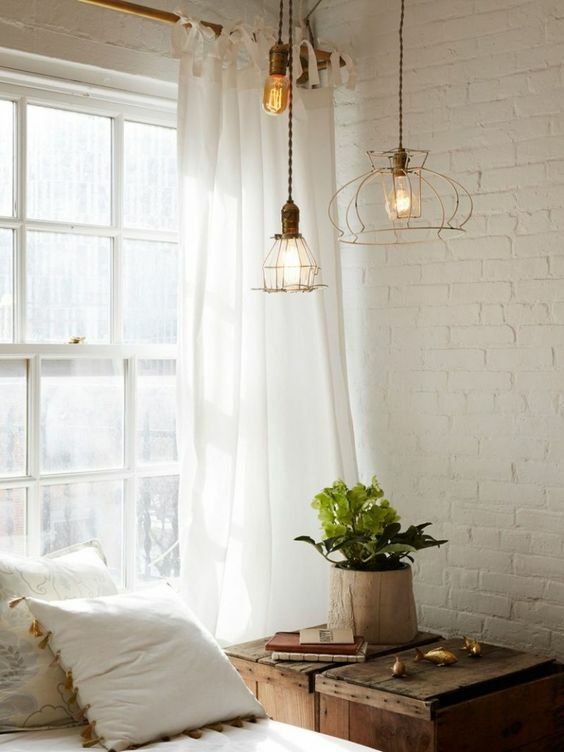 I love this stylish look and believe that the white bricks really complete the room. Do you prefer the softness of a cottage look? White painted brick walls work well here too. 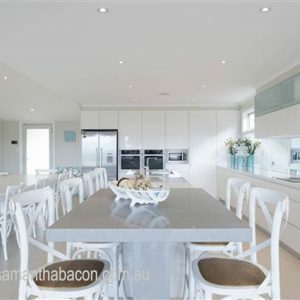 The softness of the white is far more appealing in a cottage style than the industrial look of a bare brick wall. Again, you can see the different textures in the white colour palette here which help to create a cohesive look. Remember to consider the style of brick that you have and would like to paint as this will affect the look that you achieve. A dry pressed smooth face square edge brick will obviously give you a different look to a traditional sandstock rough edged brick. 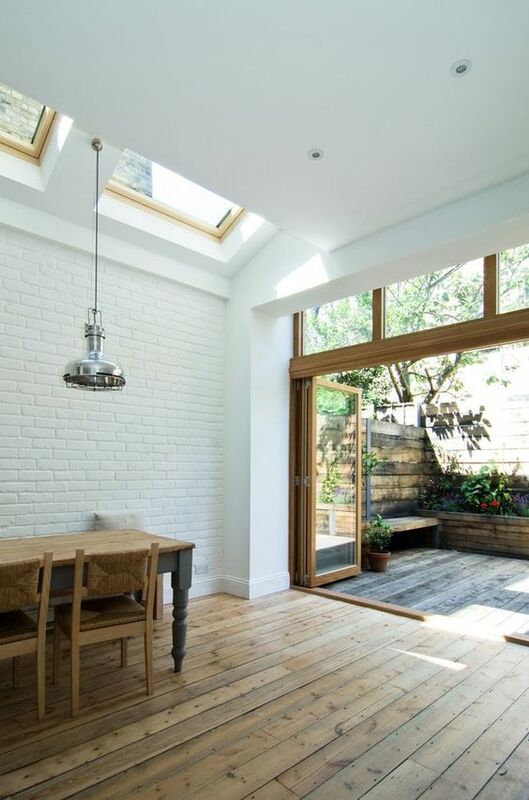 By painting bricks white that have a more uniform finish you create more of a contemporary feel. This room above is contemporary but some of the mid-century furnishings and lovely colour in the rugs gives it a softer, homelier look. 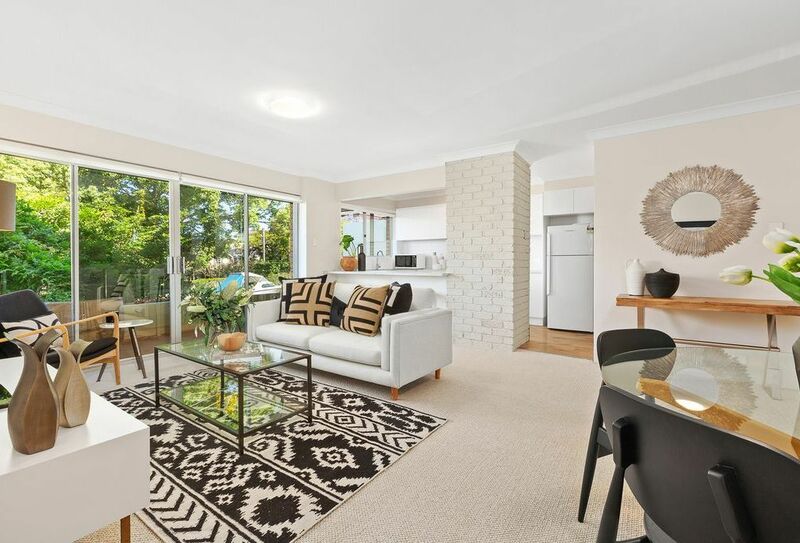 It still has the contemporary elements of a gorgeous polished concrete floor and contemporary waterfall island bench but these are softened by the textural bricks and furniture. I love it! 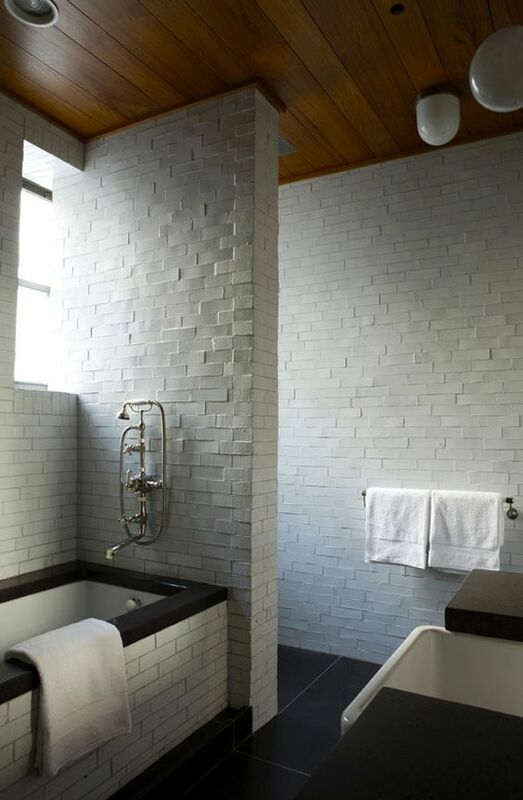 The look of white bricks is so popular that companies are making tiles and wallpapers to imitate the look. So if you love it but don’t have the brick wall to paint, you can still achieve the finish. I like to use removable wallpapers and ones which have a matt finish and 3D photographic design elements are the most realistic. Believe it or not, the image above is white brick wallpaper and you can see how effective it can be. These look really good on small walls or perhaps a large column or as a feature. You can really get away with the overall look when it is in a small amount. 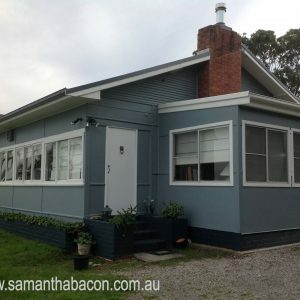 In terms of the type of paint to use, I like one with some texture in it, so those exterior paints that have a matt sandy finish can be very effective. Many paint companies offer a textured stone finish for interior bricks but they can’t always be tinted to their full range of colours. 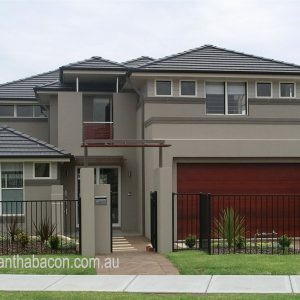 If you have a particular white in mind then you might want to just look at an exterior option. You can of course experiment with leftover white wall paint but the effect you achieve may depend on the finish of the brick. The most important point to remember is to keep the finish matt as any type of sheen will not look right. The finish of the mortar in your brick wall will also create different effects and will also dictate how difficult the job will be. Flush mortar in between the bricks gives you the flattest surface and when the bricks are painted you will just see a slight outline of the edge. This is the style of mortar most often used on heritage style homes. 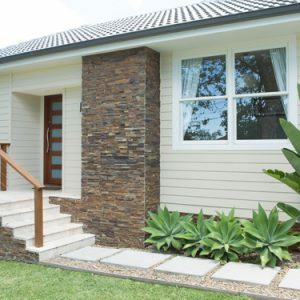 A heavily raked mortar will define each brick clearly and so when you paint the brick you will clearly see the outline of each one and this can give more of a contemporary look. 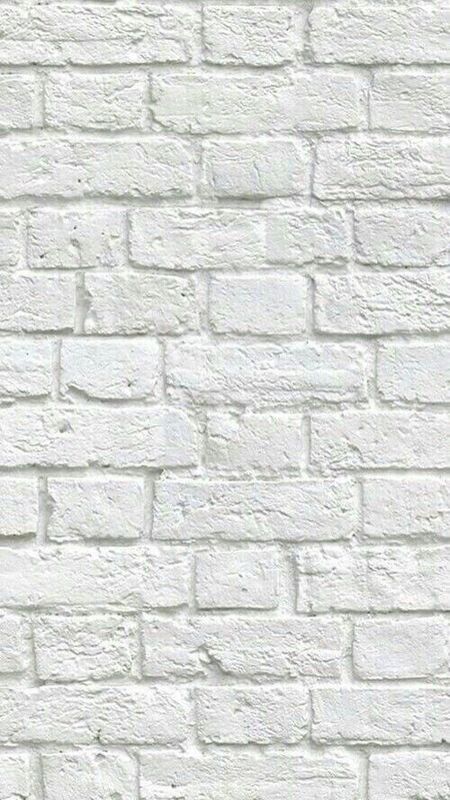 Bricks with heavily raked mortar can also be very tricky to paint white as you need to get the paint brush into all the crevices and your wrist will be complaining after 10 minutes. With bricks like these it can be preferable to spray the wall. An ironed mortar is popular now and is a compromise between the two styles and this finish would be easier to paint. I hope you can see from these images that there is a brick wall to suit many different styles and a tin of white paint and a spare weekend can completely transform the look and feel of your room. I would love to hear from you if you have painted a brick wall and if you were pleased with the outcome.